Finally got around to updating the blogroll on the site. Couple new additions – Left Leaner, One Father for Dean, Shiny Glass Beads. Also added back the webring. So if you’re looking for other good sites focused on Howard Dean, you’ve got several places to go. For those of you who are AvantGo users, you can now subscribe to this weblog from AvantGo. Every time you sync your PDA, you’ll get the latest posts downloaded to AvantGo. I’ve set it up to also follow any linked articles – so if I link to a news article or another blog post, you’ll be able to read those articles offline as well. I really wanted to like this profile, but in the end I didn’t. The article lurches forward on a few assumptions: that the primary fuel for the Dean campaign is liberal rage, that Dean is a protest candidate and little else, that the Democratic establishment doesn’t get Dean or his appeal, and that Dean – despite his aura of McCain-like “straight talk” – is actually a calculated politician who is campaigning without a platform. Here’s the thing – nearly none of that article summarizes why I’m supporting Governor Dean, what I see in his campaign that has converted me from an armchair Democrat into a political activist, or what I believe is wrong with the Democratic party right now. None of it. He’s articulate. When my wife and I hosted a fundraiser for Governor Dean last month, he fielded questions for more than 45 minutes. He hit every issue – from immigrant labor to voting rights for DC – square on the head. He didn’t waffle, and he took sometimes unpopular stands. But he addressed the questions asked, and communicated a coherent vision for what values should drive American policy at home and abroad. When Matt Bai (author of the Times profile) finds one supporter who can’t articulate Governor Dean’s position on gun control, he goes on to conclude that everyone must have blindly adopted the “he talks straight” without really understanding it. Bai is wrong – I’ve heard Governor Dean speak, I’ve watched the reaction of those hearing him for the first time, and I’ve listened to people articulate their disagreements with his policy in one breath and declare their support for his candidacy in the next. He’s smart. I don’t know how the country decided it was a good thing to have a President who’s no smarter than your neighbor. Scratch that – I do. Many voters – understandably, in some cases – equated President Clinton’s intelligence with his belief that he could think himself out of any crisis, thereby minimizing the long-term risk of those crises. As a result, we’ve got the “noo-clee-ur” President who disdains intellectual debate. You know what? I want a smart President in the White House. I want to know that they’ll think through a situation and come at it from angles I haven’t thought of. I never want an ounce of doubt that we as a country made a decision because my President lacked the intellectual curiosity to avoid the easy answer and find the right answer. Governor Dean has demonstrated he not only has the skill, he has the desire to ask hard questions and understand the nuances that permeate many of the hardest political issues today. I’m not a liberal by a long shot. I’m a Democrat, one who believes that a balanced budget and an inclusive foreign policy that treats allies as equals are two critical elements of a successful Presidency. Beyond that, a responsible tax policy coupled with a coherent fiscal policy would be nice. And as long as I’m asking, why not ask for an administration that sees the Constitution as our founding document and not just a set of suggestions? I want my country back. Howard Dean is the man who will get it back. So here’s a crazy idea – what about signing over the tax rebate that is on its way to the Dean campaign? Not only would it be a windfall for the campaign if we reached critical mass, but the PR bonanza (“Bush tax cuts fund rival campaign”) would be amazing. Gov. Dean is identified (finally!) as a progressive candidate. Later in the article, Ambinder even points out that Dean has often sparred with the liberal factions of the party. Gov. Dean is identified as a top tier candidate (this is increasingly the case, as other press coverage recently is putting him into the same “tier 1” category). The governor-as-executive angle has legs. If you haven’t been by HowardDean.tv in a few days, swing by – they have new video of the Governor’s speech in Sacramento in March (at the Democratic Convention). While this speech has been widely seen (it is still available at C-Span and Carl with a K’s site), this is near-DVD quality video. For those planning to attend a Meetup, just bring your laptop along – these videos are cached on your hard drive and viewable offline. Very nice. If you’re interested, there’s a good thread over at Slate Magazine about the Democratic race (as reported in Saletan’s piece “Democrats Turn Left“). In some early maneuvering for the 2004 election, a group of technology executives and venture capitalists said Wednesday that they believe Sen. Joseph Lieberman is the best choice for president. Getting John Doerr (a huge contributor and quite a force in the tech industry) is a coup for the Lieberman campaign. His endorsement will likely lead to others strongly considering Lieberman, and will make winning their endorsement a bit harder. I could really use five minutes of your time if you’re a CSS wiz. For whatever reason, IE 6 is misformatting my home page. It loads the entire page, but then only displays column one (with the blog posts) up to the point at which column two ends. Everything that falls below that point is cut off. If you have any idea why this might be happening, I’d love an assist. I admit it, I did it. And according to The Geek Test, I scored a 37.86982%, which makes me a “Major Geek”. The Republic of the Internet certainly has been downgraded since the day John Perry Barlow declared its independence in 1996. The Internet is not a nation, it’s not a state, and it’s not even a county. But is it at least a constituency? If so, most of the presidential candidates are campaigning there about as seriously as they are in Alaska: it’ll be surprising if their campaign plane alights there even to refuel…with one encouraging exception. Today I started work on porting the k-collector client to MovableType. This is exciting. Matt is the brains behind liveTopics, a product that fundamentally enhanced mynbspuse of Radio. Now that I’m a Movable Type user, I think this is a very encouraging sign. I’m quite happy with the end result. This is essentially the same template that I had pre-conversion (based on a Bryan Bell template); I liked the clean layout, the focus on content, and the boxes around posts that made the separation between posts more obvious. I still have a few minor tweaks to add in over the next few days, but I’m happy to see the “old” presentation. Two minor nits that I’m having trouble fixing: the border around post titles extends the full width of the post (it used to just border the words of the title, which I preferred), and text in the comments pop-up window is invisible until you scroll down the page and back up or highlight the text (at which point it becomes visible). I’ve noticed the latter issue at other Movable Type blogs, which suggests it’s a CSS issue. In fact, I’m sure both are CSS problems I’ve somehow created, but I just don’t have the CSS wherewithal to fix them. John Soat > IT Confidential: Spam Vs. Fund-Raising—A Clear Distinction > May 26, 2003” href=“http://www.informationweek.com/story/showArticle.jhtml?articleID=10100230”>It’s not like that money is going to buy Howard Dean a chance against George Bush. My guess is, the contributors thought they were sending money to the dean of Howard University, which could actually use it. You can always send your contributions, and your industry tips, to jsoat@cmp.com or phone 516-562-5326. His comments were tongue in cheek, but this is exactly the kind of defeatist Bush-will-win-no-matter-what-we-do thinking that needs to be stopped in its tracks. Let John hear from you about why you think that $1m speaks volumes about what we can do next year. Keep it positive. No need to have the follow-up column be about the flame war from Dean’s supporters; it should be about the overwhelming grassroots support the Dean for America campaign enjoys. [T]wo revelations have led me to the conclusion that Howard Dean just might represent the one and only hope of the Democratic party. Beyond that, he brings an analysis to the current race that is clearly not motivated by a desire to see Governor Dean elected. Rather, he comes at it from a desire to see the Democrats beat President Bush – and therefore is a bit more objective than some of the rest of us who committed to the Dean campaign long ago. We’re moving into an interesting phase of the campaign. There are rumors – and once these things start, they have a way of becoming self-fulfilling prophecies – that Senator Edwards is losing momentum and may pull out of the race. The Gephardt as waffler meme is starting to propogate (did anyone else catch Jake Tapper’s catty comments about Gephardt on NPR yesterday?). Carol Moseley-Braun is already making noise that the end of her campaign may be near. The battle for the departed candidates’ supporters will occupy a fair amount of effort the next four months. Those supporters will look for a few things: who’s got momentum? Who’s making a difference? Thanks to the points made in Ryan Lizza’s recent piece about the prevalence of blogs supporting Governor Dean, not to mention the shock and awe Meetup numbers, the voices those supporters will be hearing will likely be those of Dean partisans. If Matthew Langer’s turn-around is any indication, Governor Dean may be poised for a nice bump as candidates start dropping out. There’s no single answer to the question, “Why do you blog?” But the last week has certainly given me some very personal reasons for enjoying it: unsolicited positive feedback from a variety of sources. I had lunch with a long-time acquaintance yesterday who was asking about blogs. I repeated a point I’ve made here before – the personal relationships that have formed and strengthened as a result of my blogging have been by far the most valuable result of maintaining this site. It’s quite a feeling to show up in a new city and already have someone who knows you well – even though you’ve not met each other. I got to thinking about this, and realized that it’s this aspect – which I think is often under-represented when discussing blogs – that has the most potential for blogging in organizations. I don’t work in a large enough organization for it to apply to me (we have 120 employees, and we’re almost all in one location). But when I look at how blogging is flourishing at Microsoft (as just one example), it occurs to me that this could have a dramatic impact on how employees learn from each other, appreciate each other’s contributions, and feel connected to the larger organization. Many of us have written at length about the benefits of knowledge sharing – but for that model to work it requires near-total participation by all employees. What if the real benefit of enterprise blogging is “just” relationship building? Seems to me there are still some dramatic opportunities for tangible benefits to the organization. I’ve written about Chandler before, but I thought this was a good overview of what Cisco’s doing. That’s not all Chandler is willing to pay for. The department has developed online training programs for company employees as well as its own electronic discovery tool. Currently the department is developing an automated contract assembly program and installing a state-of-the-art document management system. House Majority Leader Tom DeLay (R-TX) “admitted” he “provided Texas Speaker Tom Craddick® with the same information that state police used to enlist a homeland security agency in the search for runaway Democratic legislators” last week, the Houston Chronicle reports. Political State Report has the latest. Zen and the Art of Data Restoration Standardization is elusive, even though there are so many standards to choose from. Or perhaps because there are so many. Nevertheless, for many years I have been pursuing an elusive goal of digitizing, standardizing, and archiving all of mydata. In this chapter of the journey, I ended up purchasing a 15-year-old computer to restore one file. For anyone who wants a lesson in why standardization is good, file naming conventions are important, and backwards compatibility is essential, you need to read Erik’s outstanding compilation of what he did to move from one computer to another. And yes, he really does pay that much attention to detail in real life. Wasn’t Google’s acquisition of Blogger heralded in part for the move to “Google’s more reliable servers“? BlogSpot has been especially sluggish recently and we are working hard to improve the situation. We sincerely apologize that the problem has taken longer to resolve than expected and for the frustration of having poor performance from the servers. Josh Marshall may be at it again. You may recall that he was widely credited for sticking to the Trent Lott story late last year, ultimately resulting in Trent Lott stepping down from his leadership position in the Senate. Now he’s picking at the threads of a story that may result in Tom DeLay getting the same treatment. The basics of the story are this: Texas Democrats, in an attempt to prevent state House Republicans from successfully forcing a redistricting act through the House, left the state. The result? The Republicans didn’t have a quorum, and they ultimately lost their window to introduce the legislation. It is widely known that this redistricting package was orchestrated by fellow Texan House Speaker Tom DeLay. But they didn’t go down without a fight. No, the Republicans (apparently through DeLay’s office, maybe DeLay himself) called Tom Ridge at the Office of Homeland Security and asked for help tracking down a plane. The OHS claims they were lead to believe the plane was missing or hijacked; DeLay and the Texans are vague as to what exactly they said. End result: the OHS interceded on behalf of a state agency when no criminal conduct was alleged, and certainly for which no terrorist threat existed. If you’re interested, be sure to head over to Talking Points Memo. Question: hypothetically speaking, anyone care to guess what happens to Josh’s career when he’s responsible for bagging the Senate Majority Leader and the Speaker of the House – in less than twelve months? Some campaign managers devote their energies to working the elite press or courting union leaders or wooing donors. But Trippi seems to spend an inordinate amount of his time checking Meetup numbers, posting to liberal blogs, sending text messages to supporters who have signed up for the Dean wireless network, and otherwise devising ways to use the Internet to build what Trippi envisions as “the largest grassroots organization in the history of this party.” And his efforts might actually be paying off: While many predicted that Dean would fade away once the war was no longer a salient issue, there is little evidence that the former Vermont governor’s supporters – originally drawn to Dean when he was forcefully speaking out against war in Iraq – are deserting him. In fact, the Internet might account for Dean’s staying power. I believe when the book is written about the 2004 Presidential Election, it will be the chapters on the role of the Internet that will be the most revolutionary. So far, Governor Dean’s proven that he has a team who can consistently outshine the others. The one name I keep hearing come up in conversations concerning how the candidates use the internet is Howard Dean. Let’s spin this another way: the money Governor Dean is raising is better money than what some of the other campaigns are raising. If the 80 percent figure is accurate, that means that a dollar raised through traditional means is worth just $.20 to the campaign (once you factor out the cost of raising that dollar). Sabato says there’s almost no overhead to the Internet fundraising model – but let’s be conservative and say that it takes 10% of the money raised. That means for every dollar raised online, the campaign pockets $.90. Put another way: money raised on the Internet is nearly five times more valuable than money raised through traditional fundraising. Certainly puts the fundraising totals in a whole new light, doesn’t it? Side note: the more I read about Joe Trippi, the more excited I am that he’s on board. More on that later. As the election season begins to heat up, truthout has begun pursuing interviews with the seven Democratic candidates for President. Invitations have been extended to the Kerry campaign, and we have begun to reach out to the rest of the field. The first candidate to accept our invitation was Governor Howard Dean of Vermont. We at truthout are grateful to him for taking time out of his busy schedule to speak with us. The author seems to like going along for the ride, and is far from a raving fan of the movie. But he does a good job of picking up on a few of the key themes (pardon the pun) that are central to the film. Most importantly, he digs in on something that several (including me) have talked about: that the matrix in Matrix Reloaded is far less structured and far more ambiguous than we’d been led to believe in the first Matrix. I was talking to Ernie yesterday about my iPod, and we both laughed about the wildly divergent reactions we had to Matrix Reloaded. The main reason I feel comfortable enjoying the film – incomplete though it is – is that I’m confident that once Matrix Revolutions rolls around, it will radically change what we think we know about Reloaded (in much the same way Reloaded changed what we thought about the first film). If I’m right – and we’ll only know come November – then Reloaded will prove to be a deeper and more intricate piece of work than is apparent right now. And that would end up being the same reason I appreciated the first so much – like a kaleidoscope, each viewing changed what I saw and how I saw it. That’s an exceedingly rare trait in film today – and is one of the reasons I’m so optimistic about the trilogy. I got an e-mail last night. It was personalized (they got my first name right), and they tell me that they’ve been selling “enterprise software to lawyers” for 12 years. Now it appears that they have a CRM system. Amazingly enough, after they did some research they purport to have figured out the answer to why so many CRM systems fail – and they’ve solved the problems! Seems to me that they should first figure out how their CRM system has me (a competitor) on their mailing list for promotional mailings. Then I might be willing to believe their claims of “solving” the problem of “bad data”. Nice twist at the end. Reactions? In the beginning, www.microsoft.com was just one computer tucked under a table at the end of a long hallway. It was designed to test Microsoft’s first 32-bit Windows implementation of TCP/IP, the software plumbing in Windows that enables Internet communications. Andy has tapped into a large movement of “anti-weblogger ferver.” There are a lot of them out there, believe me. It’s just a natural cycle to go through. Weblogs have gotten a lot of hype. Now it’s time for the anti-hype cycle to happen. No biggie. I’ll keep weblogging whether it’s popular or not. We are almost certainly in the trough of disillusionment when it comes to blogs. Lots of critical comments, much confusion over their “true” benefits, etc. Yet hundreds of thousands of people continue to use their weblog as a way of cataloging their thought. And companies are starting to explore how they might use weblogs for other purposes. My prediction: we will emerge from this trough into the “slope of enlightenment” during which it will become obvious that personal weblogs can be tremendous tools for capturing ad hoc knowledge and archiving it for future use. Furthermore, businesses will figure out that blogs can serve as both a content management system as well as an internal knowledge sharing platform – a much different use from the personal application, but a critical one for the business world to adopt weblogs with enthusiasm. Finally, we’ll move into the plateau, which will mean that blogs are an established piece of our computing environment. I give us 24 months to get to that point. Top 10 Tenets Of Principled Computing I am not a Microsoft hater, Macintosh zealot, or Linux nerd. I do, however, believe in principled computing. My law office uses multiple operating systems and multiple applications, some open source, some not. I care more about how my data is formatted and stored than how the data is created. My decisions about computing are not arbitrary, they are based on principles that I’ve been refining for years. After replacing the Greek knock-off Firewire card (sold at the Apple store) with an Adaptec Firewire card, everything worked swimmingly. Now I have to start ripping all my CDs, something I should’ve started doing years ago. Anyone have recommendations for noise cancelling headphones? I’m particularly interested in earbuds, so the Sony earbuds seem promising. Interface Software is probably on the right track. Interface targets one market only, professional services – which for Interface includes billion-dollar law firms such as Skadden, Arps. Other markets within professional services include accounting, investment banking, asset and wealth management, and VCs, if there are any of them left. Rick Klau, vice president of vertical markets at Interface, believes companies can learn from all those failures Gartner talks about. Horizontal approaches don’t work. CRM needs to be tailored to the specific market. And if it takes more than a half hour to learn the package, it won’t be used, Klau adds. On a lark, I splurged last night and bought a 10 gig iPod. Five hours of maddening gadget hell later, I still do not have a single song on my iPod. I’m not exactly clueless when it comes to making tech stuff work, and this has been a remarkable exercise in frustration. For those keeping score at home, those are the only three items it could have been: the iPod has a cable that connects to the Firewire card. At least he didn’t suggest it might have been the earbuds. Argh. I really, really want this to work. If anyone wants to help me debug this, the firewire card is working, and when plugged in the iPod actually says “Do not disconnect”. Yet the iPod manager can’t see the iPod and attemps to connect through Musicmatch are pointless. It keeps saying there’s no portable device available. SEATTLE, May 17 – Under fire from the Democratic Leadership Council, a key business-friendly group, presidential contender Howard Dean is thriving on the criticism, drawing excited crowds on the campaign trail and making an unexpectedly strong bid for the 2004 Democratic nomination. 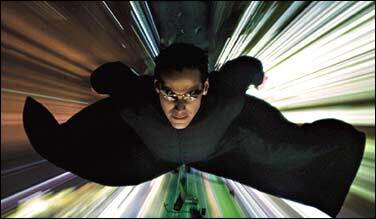 Matrix Sequel Has Hacker Cred Techies seem to enjoy poking fun at various movies that try to show hackers at work – since they always get something (and often everything) wrong in a terrible Hollywood attempt to show hacking to a general audience. So, imagine their surprise to find out that some hacking scenes in the Matrix sequel (no, I still haven’t seen it) seems to show real hacking tools being used properly. Considering the Wachowski brothers’ attention to detail, I guess it’s not that surprising. I noticed the use of SSH, the IP address, and the apparently legit Unix output while Trinity was hacking her way into the power company’s computer. Didn’t realize just how “real” the hack was. First reaction: Matrix Reloaded is fantastic. There’s as much depth here as there was in the first, with some new themes and many expansions to the first. Persephone. Not sure I get the connection yet, but clearly she’s presented as a vampire of sorts. Having the vampire clips on the TV behind her, the silver bullet, the sword fights, the baroque architecture: very Dracula. Niobe. Not sure. Like Persephone, factors heavily in the Illiad. Commander Locke (update: he’s listed in the credits as Lock, not Locke, so maybe I’m off here), most likely a nod to John Locke. (Key theme: “comprehension is not required for cooperation”.) Note: Locke (the philosopher) is also known as the “philosopher of freedom”. Wonder how that jives with Lock’s stumbling in combatting the sentinels? Interestingly, the counselor giving Lock his comeuppance was played by Cornel West. Architecture. Architecture is clearly a theme: the key to destroying the Matrix is a building, about which there are peculiar characteristics that render it vulnerable (“like any system, it has a weakness”). The restaurant where they meet the Merovingian has some clear Frank Lloyd Wright design influences (remember that the Wachowskis are from Chicago), and Neo’s ultimate confrontation is with someone/something named The Architect. One, 1 and 101 proliferate. No surprises there. Far from subtle, the notion of choice and purpose are central to the film. Humans’ choice is their defining characteristic, says Neo – and it is the “anomaly” in the Matrix that could lead to its downfall, says The Architect. That we would each have a purpose – and that the purpose might be, as in the case of the key maker, to help destroy the Matrix itself – suggests a driving force outside of the Matrix that governs the Matrix. This is of course a bit counterintuitive – if we have a purpose that is predestined, do we choose it or is it chosen for us? If the latter, by whom? To that last question, my wife had an interesting suggestion: what if, towards the end of the film, Neo can now control the environment outside the Matrix? When he massages Trinity’s heart, you see the code in the Matrix but you see his bones on Trinity’s monitor on the Nebuchadnezzar. That doesn’t follow what we know (or think we know) about the Matrix: the Matrix is a representation of what we are in the “real world”, not the other way around. When the sentinels approach (and they’re no longer in the Matrix), Neo is able to destroy the sentinels. This is possible only if he’s obtained power – and control – outside of his ability to manipulate the Matrix. I definitely want to see the scenes with the Merovingian, the Oracle, and the Architect again. Each reveals far more than I caught in the first viewing. While I agree with a few of the points that David Edelstein makes in today’s Slate (he adored the first, was underwhelmed with Reloaded), I’m ultimately more forgiving than he is. There’s more to this than we can pick up the first time around, and there was no way they could make lightning strike twice. This is a good successor to the first – but not surprisingly, it’s not as “new” as the first was. Stay through the credits, by the way – the trailer for Matrix Revolutions follows. And that’s really the message: Reloaded is less a film on its own than a middle act in a trilogy. If anything, the answer is far less clear now than it was at the end of the first. Weblogs and knowledge management Another stream of recent posts has focused on weblogs as a tool for knowledge management both to capture and share knowledge. They include a mix of posts focusing on individual knowledge workers and on knowledge workers within organizations. Jim – great job summarizing some wonderful writing on the subject. Much to come back to. Notwithstanding the current glee in Republican circles, we are increasingly confident that President Bush can be beaten next year. If Democrats run the right campaign in 2004, Bush’s high-flying poll numbers since the war will land with a thud on the deck of the U.S.S. Economy. But that’s a big If. For all the talent in the field of Democratic candidates for president, none of them will succeed without bucking conventional wisdom about the winning path to the Democratic nomination…. Myth #1: Real Democrats turn left. The DLC memo says that Governor Dean’s platform is “defined principally by weakness abroad and elitist, interest-group liberalism at home”. He doesn’t represent the “real” Democratic party, only that of the activists. What they’re ignoring is his aggressive stance on North Korea, his desire (as expressed at the California convention) to create a world in which Americans don’t have to “watch their backs” when walking down the streets of our Allies, and a more stable world order where we are not at the mercy of global terrorism. How is that weakness abroad? As for the interest-group liberalism, it’s hard to see how health care, a balanced budget and erasing irresponsible tax cuts make Governor Dean the puppet of the interest groups. Myth #2: Candidates on the left have the inside track. Painting Governor Dean as the liberal above, the DLC memo assumes it to be true and moves on, trying to conclude that he will lose the primary fight just like every liberal since McGovern has. However, the DLC makes no attempt to reconcile the liberal label with his fiscal policies, his stance on gun control, or his foreign policy statements. As such, the follow-on conclusion that he won’t win is empty. Myth #3: The primary calendar is stacked against the “New Democrats” (i.e., the centrist, progressive wing of the party). It’s more than a touch ironic that the same memo that accused Governor Dean of being elitist who knows better than everyone else is now flirting with its own delusions of omniscience. Proclaiming the Iowa caucus a “poor test of potential success” and the trend towards caucuses in general “a cause for alarm”, the DLC concludes that they know which races matter and how people should vote. Again, they’re trying to equate Governor Dean with being liberal, and being liberal with losing in the more “moderate” primaries. I don’t have access to Lexis-Nexis, but I’d love to know how many newspapers and magazines were proclaiming Governor Clinton a “moderate” candidate heading into the NH primary. How many were calling him the liberal candidate? Myth #4: Democrats are a bunch of wimps with nothing to say. Let’s go back to Governor Dean for a moment, the real target of this attack. He has boldly outlined a workable policy to provide health care for more Americans than currently have coverage, identified a way to do it that is affordable, and has also identified civil unions as a civil rights issue. He has attacked the Democratic leadership as far too often voting with the President in a naked attempt to ride his coat-tails instead of defining a unique vision for the party and the country. Agree or disagree with the position, but how can you look at those policies and conclude that they’re not bold? Myth #5: Bush can’t be beaten. Fortunately the DLC believes he can be beaten. They just seem to think that only their members – Senator Lieberman and Senator Graham – can do it. The conclusion one draws after reading the DLC memo is that Governor Dean is too liberal, he’s an elitist, and he can’t win. I forget where I read this, but whoever said it really nailed it. Trackback isn’t what I want. I want it in the other direction. I want to know which of my outbound links were the most popular. Yes yes, we know how to do it. I disagree. I first asked for Trackback in Radio nearly a year ago but it became clear that the guys at Userland didn’t see it as a compelling feature. I still don’t understand why Trackback is seen as a bad thing. In fact, now that I’m using Movable Type I have already seen the benefit. For those that don’t know about Trackback, here’s a quick explanation. Once this post is made, someone may link to it on their weblog. If their weblog supports Trackback, their weblog application will send a “ping” to my server to tell me that they have linked to me. My weblog will update my post with a link back to the new external post. The end result is that any readers of my blog who are interested in what I wrote now have a way of continuing the conversation. The people who’ve sent Trackback pings to my site likely added their own comments, or perhaps they are just writing about similar things. Whatever the case, my readers now have a way of broadening their exposure to the ongoing conversations in the blogosphere of which I’m a small part. I think blogs (and, more importantly, many bloggers) are insular: they assume that their readers are well aware of the blogging phenomenon and know which weblogs are out there that are relevant to their interests. Judging by the amount of traffic I get from Google, I’d wager that many of my visitors are seeing a weblog for the first time, or at least are not daily readers of weblogs. Consequently, it’s more likely than not that they would benefit from the extended conversation that is represented by Trackback. Like I said last fall, the issue comes down to whether you look at weblogs as a writer or as a reader. The writers want to know what gets read. The readers want to know how they can find out more. Trackback, though it’s really designed to address the latter, serves both purposes. In my first experience with Trackback, I can report that it works well. When I posted last week how I’d extended Movable Type to manage my blogroll, a number of people found it interesting. Two people linked to my post and made their own comments; thanks to Trackback, any visitor to my site can now see who else linked to that post. Dave’s last point is to ask for a way of tracking outbound link popularity. I wanted to know this too when I first set up my weblog more than 18 months ago. I used a freely available Perl script to do this – and after several weeks discovered that knowing which links my readers were following didn’t change what I wrote at all. I also don’t think that readers of my blog would really care what links others were clicking on. It’s also interesting to see Dave’s comments about Trackback in the Radio environment; given the need for server-to-server communication for Trackback to work properly, I expect that they’ll have a real challenge finding a way to implement this without relying on another third party server. (It’s those servers – for comments, for stats, for referral tracking, etc. – that really slow page loads down.) That said, I’m glad that they’re moving in the right direction. Final note: the folks at Movable Type have created a “Trackback for Beginners“ tutorial that goes over the concept in more detail. Both Reuters and CNN have great stories on the health care plan Dean unveiled this morning. Also, the Dean for America website now has a side-by-side comparison of Dean’s and Gephardt’s health care plans, a full summary, and a health care survey—along with a downloadable file including the text of the speech he gave this morning. I used Marc’s activeRenderer when I was using Radio to maintain my weblog. It was an absolutely perfect extension of Radio – making it a far more functional application. Over drinks tonight, we got to talk about what his plans are, our differing opinions about the viability of weblogging software in the corporate space (I’m a tad more optimistic than he is), and where we see this space heading. Very cool conversation. Hopefully the next time I’m in town I can take him up on his offer of a good bottle of Burgundy. In this article, Beinart refers to Dean as the “candidate of Democratic fantasy” and Lieberman as “the candidate of Democratic desperation”. Of most interest (to me, anyway), is the deconstruction of Lieberman’s strategy: focusing on blacks and moderate whites. Beinart points out that in past primary elections, those groups tended to solidify behind Mondale, Clinton and Gore (and not Hart, Tsongas and Bradley – each of whom “captured the hearts of upper-income white liberals”). This is an intriguing observation, which either looks bad for Governor Dean (since he’s inherited much of the Bill Bradley campaign staff) or good (since campaign manager Joe Trippi ran Walter Mondale’s campaign). But it does make you wonder if there aren’t some legs to this observation of Lieberman’s strategy. Wonder whether they suggested the spin to the Post’s observations that Governor Dean is leading among “the elites” in fundraising? I received my beta copy of Microsoft Office OneNote 2003 last week, and just loaded it up. If you have any experience with this, or want to share some tips before I dig in, please leave a comment. I’d love to know what others are doing wtih it. OneNote 2003 is a new program in the Microsoft Office System that enables you to capture, organize, and reuse your notes on laptop computers, desktop computers, or Tablet PCs. It gives you one place to store all your notes and the freedom to work with them how you want. OneNote 2003 also helps you capture information in multiple ways and then organize and use it according to your needs. OneNote 2003 combines the freedom and flexibility of paper notes with the efficiency and power of digital organizational tools, enabling you to work with your notes and information more productively. As a friendly reminder to anyone out there who might be a Matrix fan (rumor has it there’s a few of you), buy your tickets now. At the theater near us, three of the eight evening shows are already sold out. Finally, if you haven’t consumed the nearly infinite bandwidth required to download the four animated shorts at IntotheMatrix.com, then by all means get over there now. I was less excited by the latest installment (The Second Renaissance, Part II), but found the first three to be wonderful. All four of the free downloads, plus five others (Final Flight of the Osiris, which showed in theaters as a trailer this spring; Beyond; World Record, Play; and Kid’s Story) are available on DVD in June. Cadillac Matrix mini-site. Some good behind the scenes looks at the vehicles used in the two Matrix sequels. I heard that not a single one of the several dozen vehicles donated by Cadillac was in any kind of usable shape after filming. Time Magazine: Unlocking the Matrix. This week’s cover story about the film. Warning: Some spoilers are here. If you want to go in without knowing anything about the plot, come back on Thursday after you’ve seen the film. Countingdown.com: Seven clips in a variety of formats from the film. The Philosophy of the Matrix. A good refresher if you were under the impression that the first film was just a shoot-‘em-up action flick. More details later, but Edgar has announced that contrary to President Bush’s wishes, he will not run for the US Senate seat being vacated by Peter Fitzgerald. Howard Dean Meetup in Nashua, NH: This guy rocks! It’s way beyond midnight, heading towards 2am and I’m tired. Philip, again, is talking about schools in his community.nbspBut all I want to do is nbspgo to bed. And I would, but …………. This great man, this great leader, breathes hope into the healing of America. It is time for us to stop temporizing and compromising. We are tired of being divided by race. We are tired of being divided by income. We are tired of being divided by gender. We are tired of being divided by sexual orientation. We are tired of being divided. Howard Dean’s Call to Action is about giving you, giving me, a reason to stand up for what we believe in. Howard Dean’s Call to Action is about revoking the Bush Preemptive Doctrine. HowardnbspDean’s Call to Action is about changing presidents and changing foreign policy. Howard Dean’s Call to Action is about becoming whole as a country, community-by-community. Howard Dean is resolute. And, you know what? In fact, the former governor of Vermont is still a man to watch, if not the man to beat. In response to my last post, Kevin Thurman tells me to “shove it.” He was reacting to my sarcastic comments about Hart’s assertion that he had an army of young people who would have delivered $8m to him in the next eight months. I am skeptical of this claim – younger volunteers supply endless amounts of passion, energy and time, but rarely that kind of cash. But maybe he was on to something. The answers to the questions [Hart] has posed to the nation and the party are ours, not his. So it is up to us. Personally, I am thinking about running for office or joining a political campaign. Either way, I carry Gary, his questions, his challenges, and his vision with me and I thank him for that. The only way to repay him is by doing the same for others. So lets take Gary’s vision to the ballot box, the coffee shop, the city council, and the classroom. His exit can be seen as devastating or empowering, and that is completely up to us. That is why I love politics: fundamentally, it is completely it is our hands. Not any single person or group, no matter what Rove may wish. What Gary has done for people like Kevin and I and many others is remind us that there are still leaders in our party, still vision, still ideas. And our dedication to his cause has instilled in us a constant reminder of this tenet, and has passed on the torch of his vision so that we may guide it safely into the future. Even though Garys was a presidential bid that wasnt to be, it has brought his passion into a new generation, into the future leaders of our party and our nation. It has reminded us  demanded us  to, in the words of one of his heroes and one of mine, not look at the world and ask why, but to look at the world and ask why not. I confess that I’ve been so wrapped up in working on behalf of Governor Dean that I’ve completely missed this commitment to, and inspiration from, Senator Hart. I thought I was paying attention to this race – and I missed it. Completely. What I find intriguing is that both Thurman and Langer derive a fair amount of inspiration from Bill Clinton, and in that I see parallels to my own political “upbringing”. I was a college senior when I volunteered on the Clinton campaign, saw him speak at two political events, and even went to the inauguration and crashed one of the inaugural parties. I remember the commitment, the faith and the unbridled enthusiasm I had for our direction at that point. It’s incredible how far the party’s fallen in just over a decade. Kevin and Matt both talk of grand ideas, of questions, and of vision. Interestingly, those are the exact reasons I got behind Governor Dean in the first place. For their own reasons, Kevin and Matt do not see what I see – and for that, I’m disappointed. I don’t expect to convert them – but I do wish them luck, and hope that they find a candidate worthy of their commitment. One thing I’m sure of – the party needs more people who are willing to drop everything and do whatever it takes to elect a leader worthy of the office. So – to Kevin and Matt, and any other Hart supporters out there, I’ll say what I should have said earlier: be proud of your efforts to this point, and stay in the game. Do whatever you can. We need your help. One of the things I did in Radio was use the built-in outliner to manage my blogroll, and then use Marc Barrot’s activeRenderer to add it as a component on my home page. Once I moved to Movable Type, I needed to find a way to manage links to other sites from my weblog. I’m surprised that there’s not a more elegant solution built into Movable Type – the development community has built some pretty incredible extensions to the system (a good directory of plugins to Movable Type is here). Note – there is a blogroll plugin, but it requires an OPML file for rendering; since I’m not using an OPML file that’s stored on my web server, this wasn’t a practical option. I did find a mention of using as a way of incorporating content into my page. It ended up being a perfect solution. From Movable Type’s Templates menu, create a new template called “Blogroll”. In this template, create a list in HTML with links to the sites you want to include. (Use the BR tag to force a line break between items.) In your “Main Index” template (the page that controls the look and feel of your home page), under the “Links” sidebar, use the following syntax: . Each time the index page is built, it will incorporate whatever content is listed in that “Blogroll” template. Who would have thought that one of the most powerful personal knowledge management tools available to us is the simple alphabet. For a while now I’ve been using the ideas of David Allen and his Getting Things Done (GTD) process for organising oneself. His ideas for keeping track of projects, ideas, actions and reference materials is personal knowledge management to the quick. For me and others has helped to quieten down the background noise of reminders for those things not yet done. One of the simplest yet most powerful ideas within GTD is the reduction of noise in a personal filing system. How do you file your own reference materials? Two parameters drive the system. 2) It must be easy and fun to find materials otherwise you won’t trust the results of step 1. This is the beauty of the alphabet. Simply categorise what you have in your hand (and I mean simply), put it in a manilla folder, label it and file it under the first letter of the label. All in order and quick to retrieve. When you need something, what you have filed will be on only 1-3 places. My gas bill will be under G for Gas or T for TXU my supplier. I can find it quickly and so can my wife if I’m not around. A complicated system may have had me file my gas bill under Bills -> Home -> Utilities -> Gas. Far to difficult to recall and far to difficult to initially categorise because I have to keep the categories and their rules in my head. Hence, nothing gets filed and it all piles up. I came across the General Reference Filing tip before the book had arrived (Amazon isn’t the quickest on postage across the Pacific) and implemented it straight away. Read the tip a couple of times and buy a labeller. It makes all the difference. Scanning consistent and well printed text is much quicker than reading handwriting. It once took a while to read all the folder labels for my gas bill which were not ordered alphabetically, were handwritten and not always in the same place on each folder. Just now I found it in under a second. My filing cabinet is now more useful than the 4-drawer box it was. This morning I re-organised my Outlook folders the same way. I now have a Reference Filing file (separate from my mail .pst file) and within it a long list of alphabetically ordered folders. Within five minutes I had most material refiled under the new system. That itself shows how quick the filing and retrieval can be. This afternoon my Palm Pilot is going to get a good re-organisation as well. Boy does this article ring hollow: Gary Hart claims that he would have had the best chance of beating President Bush in 2004, and that the young folk could have raised $20m for him in 8 months. Uhhuh. In a long, biting survey of his own chances and the nine Democrats currently running, Hart said that young supporters could have raised $20 million for him over the Internet in eight months and that he had the best chance to beat President Bush. MIAMI, Florida (AP) — When the chartered Boeing 727 reached cruising altitude, 87 passengers took off more than their seat belts. They removed their clothes. Charmaine learns to blog! I love it. I realize what it is that distinguishes him from the other Democratic politicians and what makes his candidacy seem, especially to political insiders, so improbable. … [W]hat makes Dean seem like such an outsider is, curiously, that his passions should inform and drive his politics, and that the game of running for president should be about issues. There is something anachronistic – and refreshing – about this; it’s no coincidence, after all, that Dean often brings to mind the principled President Jed Bartlet of television’s The West Wing, and not just because both men are urbane liberals, married to doctors, or former governors of New England states. Tonight, Howard Dean will be interviewed on CNBC’s “After Hours with Maria Bartiromo.” The show will air at 9pm Eastern and will repeat at midnight. It’s Dean’s ability to connect with Democratic voters that impressed many of the people who met him here this weekend. But it remains a serious question in the minds of voters, particularly South Carolina Democrats, whether a physician-turned-politician from a small northern state with a weak fund-raising base and almost no name recognition can win the nomination.